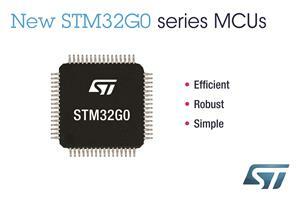 Geneva, December 4, 2018 - By adding the new STM32G0 microcontrollers (MCUs) to the STM32* family, STMicroelectronics (NYSE: STM), a global semiconductor leader serving customers across the spectrum of electronics applications, is stretching the portfolio of top Arm® Cortex®-M-core MCUs to more thoroughly cover key embedded-market segments. The new G0 series targets entry-level applications that require greater energy efficiency, functionality, security, and value, in a smaller footprint. Extremely flexible packaging and memory options enable designers to do more within less space, and save cost. A new power-distribution architecture reduces external power and ground connections to just a single pair of pins, allowing more of the package pins -- a precious resource in many embedded projects -- to be allocated for user connectivity. To provide robust security for today's connected devices, the STM32G0 series introduces a variety of hardware-based features including memory protection to support secure boot. Some devices in the series add to these features an AES-256 hardware cryptographic accelerator with a true random number generator (TRNG) to aid encryption.